Being a teacher means that the holidays are usually a bit tight, but sometimes your grade level teammates are just the best, and you want to give them a little "thank you" for always being there. 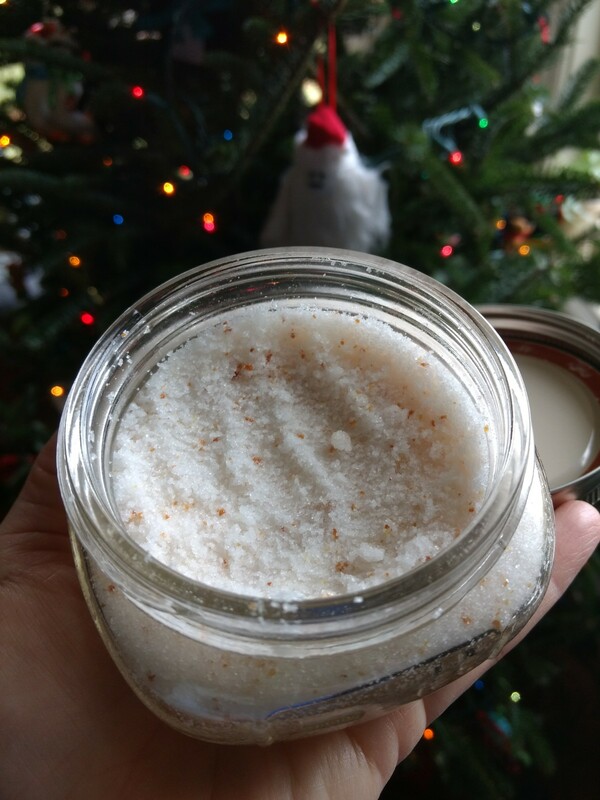 In this second installment of the "easy, inexpensive, but thoughtful gifts" posts, I'll be showing you how to make a simple sugar scrub! I wanted to give you a base recipe in case you have any friends with sensitivities to certain smells, and flexibility so you could find something that works for you. 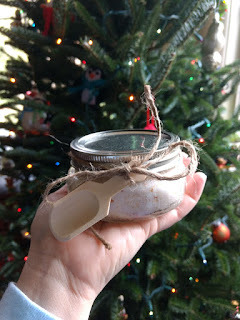 **wide mouth jars are MUCH easier for getting the scrub out. I love these jars which can be found at Target! You can use a regular jar, but you may need a spoon to help get the scrub out once you get half way done with it. That being said, you can get really thrifty by reusing plastic containers too. 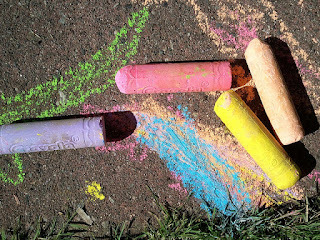 Old sour cream or yogurt containers that are cleaned out and painted over would be another great idea! Mix together your sugar and oil of choice. If using coconut oil, it is a little thicker so be sure to mix the sugar in well. You can adjust this recipe by adding in more sugar if you feel it's too "juicy." If you use a liquid oil like olive oil, you may adjust it a bit. Drop in the essential oil of your choice and mix well. Also, when choosing an essential oil, be sure it is one that is okay to put on skin. Just because something is natural doesn't mean it is great for your skin! Smells tropical when using the coconut oil, if using liquid oil it makes a lovely orange smelling scrub! Sweet orange oil is also one of the cheapest essential oils, making it more accessible at $4-6 a bottle. To use the scrub, take a small amount (about a Tbsp) into your hands and rub all over your hands, especially over any dry areas. After at least 30 seconds, run hands under warm water until you feel all of the sugar has washed off. Pat hands dry with a towel. If you want labels or the instructions printed out download my free file here. Sweet Orange Essential Oil: This can be found at some stores like Whole Foods, natural food/natural product stores, and you can order it off of Amazon as well. There are lots of options, even organic. The larger the bottle, the better the price per ounce, but this is one of the cheaper essential oils which makes it a great option for inexpensive gifts! You can get small bottles as cheap as $5 and they will make a lot of scrub! Dried Orange Peel: The dried peel adds another exfoliant as well as speckles of color in your scrub! Dried orange peel can be found in the spice aisle in a bottle in some grocery stores. My Publix has it in with the regular spices in the Spice Island brand. I've also seen it at Hobby Lobby where the soap making supplies are located! It is about the same price on Amazon for 1 oz. If you buy in bulk, it's obviously cheaper. 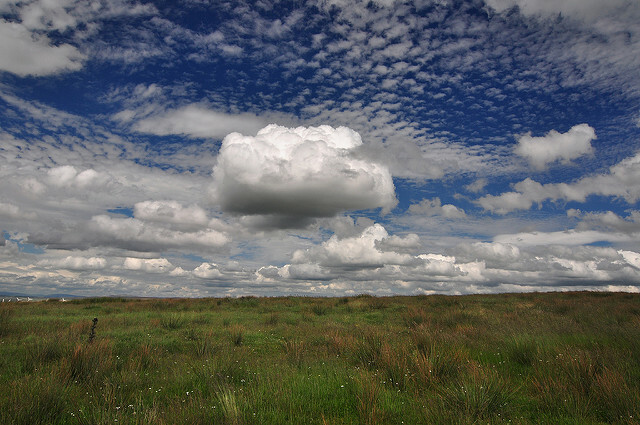 This stuff does keep a long time because it is dried out. If you have a natural food and/or natural products store like Garner's Natural Life, that is the BEST place to get it. Some of these natural product stores have bulk herbs, dried flower petals, orange peel, lemon peel, lavender, etc... and you put the amount you want in a bag, and you are charged by the oz. Cheapest place I've seen it. * I like to make a simple tag or jar lid topper (I'll include one for the above scrub) to list the ingredients before giving as a gift. Some people really appreciate this so they can see exactly what went in the product. With the abundance of allergies, it's always a good idea! *I like to tie a piece of natural jute rope around the lid. 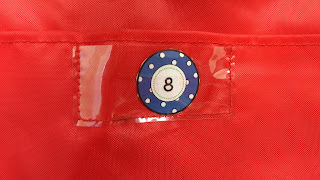 You can also use this to hang the tag if you make a tag instead of a jar topper. *If you want to get super fancy you can add on a wooden scoop! I found mine at Hobby Lobby on 50% sale, but you can also get a bunch of them for about $10 here on Amazon. I hope this gives you a fun, simple, inexpensive gift idea for your teammates, family, or friends...or yourself! This isn't just great for the holidays, but for birthdays or Mother's Day as well! "Did I miss anything while I was out?" Anytime a student asked that question I always just stared at them for a minute...as tempting as it was to reply, "No, we all just sat around yesterday and did absolutely nothing," I minded my tongue. I know they mean well, but I always got a kick out of the way it was asked...as if the planets aligned perfectly so that they would somehow get away with no make-up work responsibilities. It is easy in a bustling classroom environment to forget to collect make-up work for an absent student. I decided that I wanted to start a "While You Were Out" folder for each student that was absent. I figured I could collect any work we had done in the folder and the student would be able to see exactly what they missed. This was a great tool, and it really helps keep up with the work, but it was even better once I learned to share the responsibility with my students. At first, I thought about making it a classroom job, but found it easier to have the students sitting near the absentee help out! At the beginning of the year, I had explained the purpose of the folders, and told the students how they would help. I explained that if their neighbor was absent, they would help by being sure their neighbor got a copy of each sheet or activity they had a copy of, put the absentee's name on the assignment, and place it in the folder. 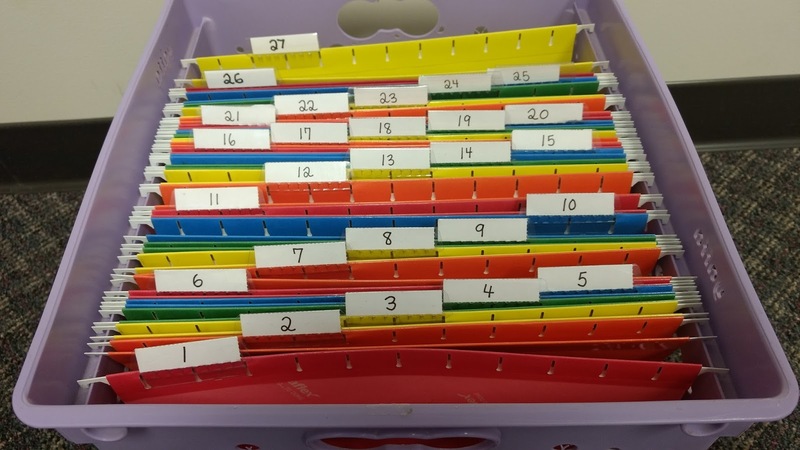 The students liked the responsibility, and using the folders stopped work from being shoved into their absent students's desk where they wouldn't see it. Depending on how quick the student is with the make-up work, you can have them turn in each assignment as they are finished (checking it off as you go), or they can turn the entire folder back in at once with all of the work. This totally depends on your preference! On a related note, I also kept a running log of who was missing work. If I was grading a pile of papers, I'd note who I didn't receive an assignment from, or who was getting it back to do some additional work, etc... These names went in a box on the board that said "Missing Work!" This served as a reminder for students who had finished an assignment early and had extra time in class. If you haven't tried using a folder for your absent students, I highly recommend it! You can get 3 different designs for folder covers and the form in my store for free! Just click the cover above to go to my store so you can download the file. If you have any other tips or ideas for keeping up with make-up work, please share your ideas below! What Do I Need to Copy? Since the school year has just begun, or is about to begin for some of you, I wanted to share one of the best organization systems I've used, copy binders! Nothing like lesson planning and thinking to yourself, "Now...what did I use for that activity last year?" I had this happen. A lot. I also would arrive at the copier with one sheet I needed for a subject, but I had forgotten another one I wanted to go ahead and copy. Don't get me wrong, I kept files for every unit and even color coded my file folders so all science was green, all math was red, etc.. Each unit was labeled and had its own folder. The contents of those folders were pulled and put back in (usually..ha), but in no particular order. The problem is, they held anything related to that unit including references or posters. Here are some of my binders, not all are pictured. Looks simple, right? Well, it is. Even more simple is how I set it up. Instead of sitting down and thinking out the entire year at once, I decided to build my binder system as I went through the year. So, I bought a 1 inch binder with a clear cover (these are cheap!) for each subject (math, science, social studies, reading, ELA/writing, word study) and I also kept one called "General." General was where I kept things like copies for their take home folders, letters I sent home to the entire class, field trip letters, volunteer letters, Scholastic book order forms, etc... It also held all of my beginning of the year info sheets! I also bought a box of regular sheet protectors like these. I should note, you don't have to buy the absolute top of the line for these...since they aren't being pulled in and out everyday. I kept these binders on my shelf, and every time I made a copy, I made one extra and slipped it into a sheet protector in the binder. I made sure to put it after the last thing I copied to preserve the order in which I used it. Once the year was over, I had every subject with every copy I had made in order. I placed a sticky note on the last thing I copied to make this even easier. (You can see some sticky notes sticking out of my binders!) Once the year was over, I could even put in dividers for each unit to make things more simple. Now, I feel I should say that I still kept my file folders too. As I said before, not everything was something that I copied. However, I loved being about to come in, grab the subject binders I needed to copy for that day and head to the copier without having to dig through folders! It also helped me get rid of things I realized I didn't actually use from year to year. It may not be something you feel you need, but I just wanted to share because I loved having this organization method! It helped tremendously and it was something I did over a year so it didn't take a ton of my time. Time is too valuable when you're in charge of 25 students all day! Click red "P" to pin, anywhere else on the picture to get the covers! Let us know how you organize! Have you found a solution that works for you? How do you "Halloween" in the Classroom? *Okay, confession...I live in South Carolina and it was literally over 80 degrees most of this week, so yeah, the "cool air" part is not really happening, and therefore hoodies and bonfires aren't either yet, but autumn is still my favorite time of year! Anyway, another thing I just love about the autumn/fall is Halloween! Ever since I was a child I just loved the "spooky" decorations, ghost stories, and dressing up like someone or something else. Okay, and the candy...who can leave that out? But still, it can be tricky this time of year in a classroom. Some schools and districts allow Halloween related activities or decorations, some allow limited activities or decorations, and some don't allow any Halloween related items or activities. Whether or not your school allows Halloween items and activities, the kids sure remember that the holiday is going on and you can't exactly just sweep it all under the rug. I know as a child (*cough* and adult) I was drawing jack-o'-lanterns, ghosts, and bats on the margins of my papers. Some of us get wrapped up in the fun and it's hard to completely let that go no matter whether you're at home or school. Some schools also may only allow Halloween activities so long as they comply with your state standards in some way, and some not at all. So, how do you balance what you're allowed to do versus engaging the kids in the fun of the Halloween season? * Okay, this is always a BIG deal for kids this time of year. One way we helped combat this was holding a "Dress Like a Book Character Day" at school. The trick was, the character had to be in a book. 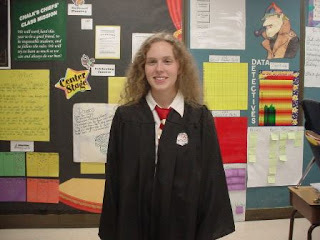 I usually dressed as Hermione Granger myself, but the kids got really creative with this one, and we always had a lot of fun sharing who our character was and why we chose them. You could even visit other classrooms and have the students write a quick 30 - 60 second monologue from their character's point of view to get other kids interested in their book and character! * You could hold a "Vocabulary Parade." Now, if you have never read Miss Alaineus, A Vocabulary Disaster please consider reading it. It's hilarious, the kids will probably relate to her plight, and in the book they have a Vocabulary Parade where she totally lives up to her mistake and has fun with it. The kids all dress up as a vocabulary word in their own creative way. My friend and I did this with our students and then had them parade around each other's class. They had the word displayed somewhere on them, but the costumes were creative and fun. Each student came up and said their word and definition, it was the most fun we've ever had with vocabulary words! * If your students are researching historical figures, inventors, or even careers, you could have them dress up as that person, or someone who has that career! It always adds fun to the project, and allows the kids to dress up at school. Plus, you don't need a lot of special materials to make this happen! *This is a great time of year to have a day to focus on animals that might bring a fright to some students (and adults). You could have activities centered around snakes, bats, owls, or "creepy crawly" invertebrates. You could assign different types to students and have them research them. It may also teach them that the animals aren't really that "scary!" If this interests you, I have one of these units already made: All About Bats! In my unit I tried to cover different subjects and give you a variety of activities to be done over a day, or week! *Pumpkins...not really "spooky" but definitely related to Halloween! One activity I did with my students was dressing up pumpkins as part of a descriptive writing activity. I used to do a "Which Witch is Which?" but when things got a little more strict with Halloween activities, I opted for the pumpkins which are arguably representative of autumn/fall as much as Halloween! Both of these activities are here: Which Witch is Which? and Guess That Pumpkin! For the pumpkin activity, they had to decorate/dress up their pumpkin and write a very descriptive paragraph using a lot of adjectives to help students guess their pumpkin. A lot of pumpkins came in looking similar, but if they did a great job with their description, usually the students guessed correctly! We then sometimes voted on the "best dressed." 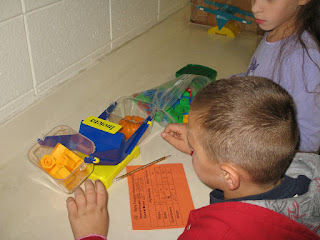 *Another pumpkin activity was reading two books about pumpkins (fiction and non-fiction) and comparing them. For this I used Big Pumpkin by Erica Silverman (this was with 3rd graders), but if you wanted to skip the witch in the book, there is also Too Many Pumpkins by Linda White or Pumpkin Jack by Will Hubbel. For the Non-Fiction book, I just chose one that talked about pumpkins and their life cycle and uses. I chose Seed, Sprout, Pumpkin Pie by Jill Esbaum, but any non-fiction abotu pumpkins will do! We read them aloud and discussed them together, then we made a venn diagram and the students used post-it notes to help compare the books. *And more pumpkins... Pumpkins are just so accessible and can be used in science and math so easily! (Although I haven't had time this year to put all of my pumpkin activities together, I'm planning it out, so be on the look out next year!) With the help of parents I got each child a "baby pumpkin" and about 6 large pumpkins for the entire class. Over the course of a week the students weighed their pumpkin, measured it's height and circumference, compared their pumpkins, and then some even used them in the above mentioned descriptive writing activity! With the large pumpkins, we weighted each and then predicted how many seeds we thought would be in their pumpkin (each group was in charge of one large pumpkin). We graphed the results, which was a great class activity. I had a volunteer come help cut the tops and in the science lab we scooped out the seeds, and tried to count them. Was it a little messy? Yes, but with lots of newspaper on the tables, and sinks near by, it wasn't so bad! We compared the results to their hypothesis, and then I even had a parent volunteer to roast the pumpkin seeds for later in the week. Healthy treat, anyone? For those of you who are allowed to do some Halloween related activities, but need something to fit standards, be sure to check out my "Halloween: Five Subjects, One Day" product in my TpT Store! No matter how you celebrate this festive time of year, I hope that you have some ideas you can use in your classroom! Be sure to enter on my Facebook page by October 18th! Wow, it's here again...back to school time! Boy can it be hectic, right? Between getting your classroom ready, figuring out your roster, and the loads and loads of paperwork, you deserve a medal just for making it through the first week! Well, I just wanted to share something that was a tremendous help to me in the classroom to help with organization of student papers from the get-go! Once all of those student and parent information forms, volunteer forms, PTA forms, etc... are gone, then you'll have the daily assessments and activities that students will be turning in. I wanted a way to be sure students were held accountable for turning in their papers, but in such a manner that I could keep everything in number order (alphabetized) in order to make grading (and especially recording those grades in my computer) a breeze! This is the system that I came up with after some trial and error. This isn't a huge revelation for many of you, it's simple, but it worked really well! First Goal: Finding an efficient way to have students turn in papers where I can easily see who hasn't turned in work, but also keeping them in order. My solution: Hanging pocket chart with student numbers! Why does this work? Well, I tried paper turn-in's a couple ways. First was the "mailboxes," you know, the stacked plastic paper sorters. With this method, while it kept the student's work in number order (I had my mailboxes numbered to keep them in alphabetical order), it took up a lot of room on my table. Also, to see who hadn't turned in their work, you had to go over and look into the boxes to really tell, so I then tried a system with clothespins to see who had turned in work, but some mornings when we had 2-3 assignments, some students got a little confused as to if they owed work or not. Finally, we came to my final solution of the pocket charts with numbers. Why does this work better than the other ways I tried? First off, this pocket chart can hang on a wall or bulletin board, and takes up a lot less space on tables or my desk! Second, when work was turned in, I could see which pockets were empty (even from across the room) and could monitor to see if those students were on task, needed help, etc... Also, it allowed me to quickly write down those names that owed me that work before moving onto another assignment. This allowed me to remind them or help them during any down time or other opportunities they had to work on it! After each assignment, you could either have someone collect them, or leave them in the pocket for the end of the day. If you waited until the end of the day, this still worked great because I'd start with the assignment that was last turned in, collect them in order, write down what was missing...and it was all in alphabetical order! Third, it was much more neat, streamlined, and tidy. I was always a teacher who struggled with being tidy with my papers, and I wanted to be a good model for the students. This was a huge help! If you're looking for a pocket chart like that one (I actually received mine from Highlights magazine as a gift for participating in their classroom program) there is one on Amazon just like it here: Learning Resources Organization Station Chart. (I am currently not an affiliate, so I'm not making anything off of this suggestion!) Also, those cute little circle cut outs with their numbers can be found here in my TpT store! I used these suckers for everything...even their cubbies! 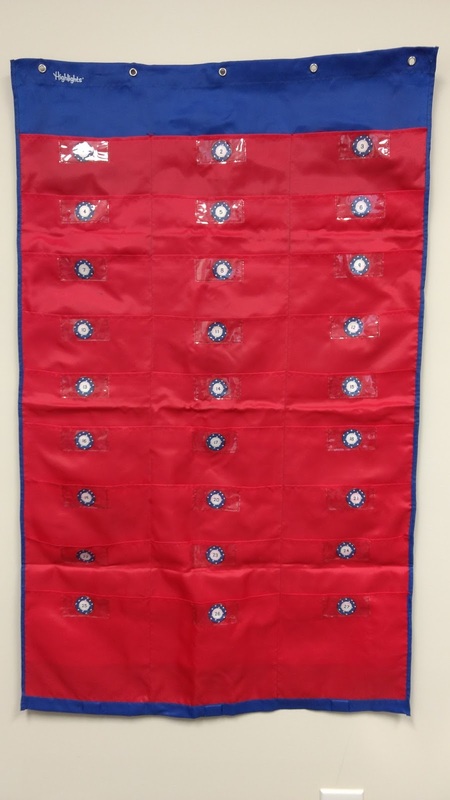 However, if you prefer to have a little bit bigger pockets (that can also hold file folders, I could suggestion this one on Amazon called Organization Center Pocket Chart. But wait...what about after grading? How did I get those papers back to the students to take home? Well, all the schools I've worked at have "take home folders." This was a weekly communication method to send home important information and grades to the parents. So, it was important that I had a way to collect all of the papers for one student so that stuffing the folders was a breeze! 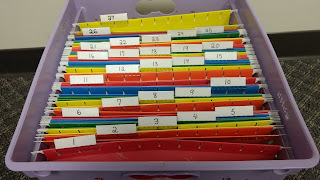 The easiest method I found was using a portable file box (one with a lid and a handle) and multicolored hanging folders that I numbered with the student numbers. After grading a stack of assignments (that were in order, thanks to my pocket chart), I simply dropped them one by one from front to back into my hanging file folders. By the time I stuffed folders for the week, I could simply start with student #1's folder, grab everything in their folder, and stuff it into their folder. But wait...what about any papers that needed to be signed? Well, as I filed away my graded papers, if the student had to get a paper signed (for me this was anything lower than a C), I stamped it with "Please Sign" on the top. As I filed my papers, if it had this stamp, I simply filed it vertically so it stuck up out of the top of that student's folder. Another reason I loved this file box was because of the portability! If I had a ton of things to grade, I could take my paper clipped stacks of assignments, place them in one of the unused folders in the back, and take the entire thing with me. It even held my grade book, my stamps, and my pouch of pens/highlighters. Mine was similar to this one by Sterilite, but this one by Oxford works as well and is a little cheaper! As for the folders, it helped me to have a repeating color pattern so the folders didn't look too similar. My set is similar to these by Amazon Basics. There are tons of color varieties around if you look! I hope that if you are struggling with keeping up with student work from turn in, to grading, to returning in folders that this post helped you out! The best thing to do is find a system that sounds like a winner for you and try to implement it as early in the year as you can to keep the students responsible for turning in their work where it belongs! Let me know if you have any questions and best of luck as you begin your new school year! As you can see, the blog has had it's "redesign" and I'm still working on making it match my store and Facebook so you might see some changes there too. One of my latest projects (posted) was the Plant Life Cycle products and bundle including my own personal set up for growing plants in your classroom without having to buy one of the expensive "plant kits." Thanks to some items around your house (or the dollar store...or Amazon) it can be pretty simple. I've included links to help if you want to purchase items (including the seeds) from Amazon. However, the items are simple and cheap and you might already have them in your closet at school! I also wanted to let you know that after many requests I will be working on the 5th grade version of my Common Core Math series. It will include presentations, assessments, activities, interactive notebooks, and vocabulary just like my 4th grade products. Also, be sure to follow me on Facebook because I'm hoping to do another giveaway to celebrate hitting 1,100 followers on TpT! Stay tuned, because I'm planning a lot more blogging, and that means more fun and giveaways!